During Brazil’s military dictatorship from 1964 to 1985, the government clandestinely pursued a nuclear weapons program. In 1981, Brazil and Iraq signed a nuclear cooperation agreement that led the government to ship 26.7 tons of uranium dioxide to Baghdad. In 1989, the former head of Brazil’s nuclear weapons program worked in Iraq as a consultant. With the return of democratic rule, Brazil and its rival Argentina jointly renounced the manufacture of nuclear weapons. But, the Brazilian program continued secretly, and when a new government came to power in 1990, it found and destroyed a 1,050-foot-deep shaft built by the Air Force in the heart of the Amazon that had all of the characteristics of a nuclear test site. The Brazilian Navy has long been working on a program to build nuclear-powered submarines. 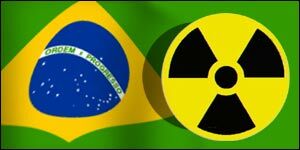 Tags: Brazil, Brazil's Clandestine Nuclear Program, Clandestine Nuclear Programs. Bookmark the permalink. Wow… this desperation for having nuclear weapons seems so ridiculous to me. What Brazil and the rest of the world wants to do? Declare to everybody that they have a bigger male organ than their neighbor?